Intense sunlight and warm afternoon temperatures describe the conditions any plant in a west-facing window box must endure every day, regardless of season. Large window boxes with more soil provide better growing conditions, and a light-colored finish reduces soil temperatures and moisture needs. The best tip, however, is to select plants that can tolerate heat and dry soils. A natural choice for a sunny, hot garden location, succulent plants produce fleshy leaves that retain moisture, which reduces the need for extra window box watering. Both hardy and frost-tender succulent plants exist at the plant nursery; make sure you choose cold hardy plants if you want the window box to remain green and interesting across the winter. Avoid using cacti or agave since they bear spines, but consider using lush-looking succulents like hens-and-chicks (Sempervivum spp, Echeveria spp.) en masse or lots of cascading stonecrops (Sedum spp.). Even mother-in-law's tongue (Sanseveria spp. ), especially the dwarf varieties like "Hahnii" or "Twist", would look attractive and grow nicely in a window box. Even though your window box soil is not sandy, the fast-draining qualities and reality of the soil warming quickly mimics the conditions experienced by plants native to sandy-soil regions. Plants native to the coast already survive harsh conditions--sun, sandy soil, wind and even salty air. Using some of the more attractive plants in a west-facing window box reduces the need for watering. Or, select wildflowers or perennials native to sandy soil regions, such as Florida or the Caribbean. Dune sunflower (Helianthus debilis), red sage (Salvia spp. ), blanketflower (Gaillardia pulchella), Tampa verbena (Glandularia tampensis) and tickseed (Coreopsis spp.) are a few examples. Purslane and moss rose (Portulaca spp.) provide showy flowers that open only when the sunlight hits the plants. Even if you copiously water the window box which receives the intense afternoon sun, if your plants do not handle heat, they'll wither away. Choose annuals that prosper with the reflective heat and light rays without faltering. Mix them for a bouquet-like composition, or mass all one species for an impressive floral display. Florist geraniums and ivy geraniums (Pelargonium spp.) tolerate heat and slightly drier soils thanks to their fleshy stems and leaves. Creeping zinnias (Zinnia angustifolia and Sanvitalia procumbens) also work in window boxes. Avoid using geraniums and zinnias if your long, hot summer is extremely humid. 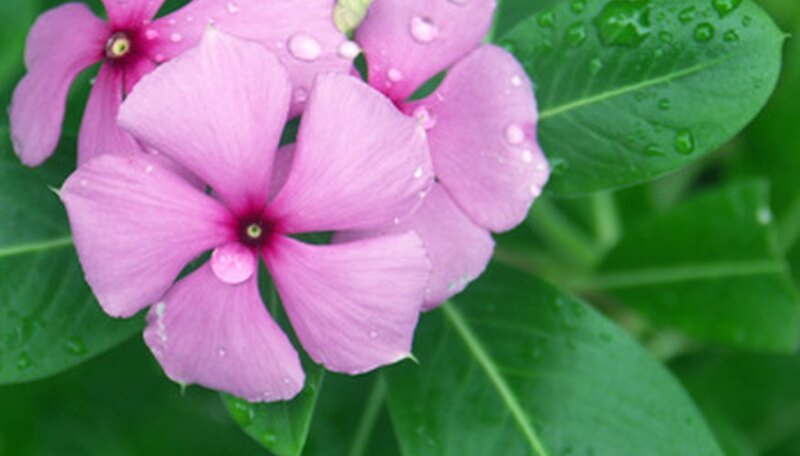 Madagascar periwinkle (Catharanthus rosea), also called vinca, arguably becomes the best annual choice for hot, moist to dry soils. Both mounding and cascading varieties exist. Bronze-leaf wax or fibrous begonias (Begonia spp.) tolerate heat and the intense sun, but if soil becomes too dry, they tend to look stunted. Reduce reliance on heat-loving plants that grow too large for window boxes or develop such an extensive root system as to hog all the water from other plants. Sweet potato vine (Ipomoea batatas), lantana (Lantana camara) and purple fountain grass (Pennisetum spp.) become humongous and take-over the window box by summer's end.